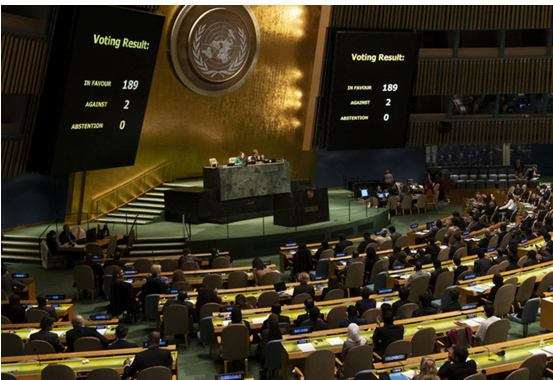 Through the resolution, the General Assembly also decided to include the agenda item entitled the “Necessity of ending the economic, commercial and financial embargo imposed by the United States of America against Cuba,” in the provisional agenda of next year’s session. The vote on the resolution is unenforceable, but the Cuban-sponsored resolution shines a spotlight on the international isolation of the US regarding the embargo, which was first imposed in 1960, when late leader Fidel Castro came to power, following the revolution. Speaking ahead of the vote, Cuba’s Foreign Minister Bruno Rodriguez Parrilla outlined the impact of the embargo on Cubans, especially due to restrictions on lifesaving medicines. “Incalculable human damage has been caused by the blockade, which qualifies as an act of genocide,” he said, referring to the convention on the prevention of genocide. “It would also be a violation of International Humanitarian Law, in the context of a conflict,” he said. Member states who addressed the Assembly over two days, overwhelmingly called on the US to end the embargo and other punitive measures against Cuba. National representatives said that the nearly six‑decades‑long blockade imposed on the socialist island by Washington impeded its right to development and its ability to participate fully in the global economy. They also urged the US to heed the Assembly’s repeated calls to lift its restrictive policies. In contrast with the pro-imperialist policy of Israel’s far-right government, last year a Communist Party of Israel (CPI) delegation visited Cuba after having received an official invitation from the Communist Party of the island nation. Adel Amer, Secretary General of the CPI, MK Aida Touma-Sliman (Hadash – Joint List) and Salam Bilal, secretary of the Nazareth branch of the party, participated in the delegation. The members of the delegation condemned the economic, commercial, and financial blockade imposed on Cuba by the United States. “Cuba is the main Latin American bastion against US imperialist hegemony. It is a source of inspiration and an example of resistance. Cuba is hope,” said Amer during the long interview with Cuba’s Granma daily newspaper.